What visitor to New Orleans would leave without having tried a seafood dish like a gumbo or remoulade, or any number of innovative seafood dishes prepared every night by the city’s growing number of creative restaurants? Situated on the Gulf Coast, seafood has always played a major role in New Orleans cuisine. Chef Gisele Perez, a New Orleans native who loves to showcase the delicacies of her home town, shares this favorite warm weather salad that brings together the best of New Orleans food. This recipe is versatile. You can mix in whatever vegetables you have on hand – artichoke hearts and slow oven roasted cherry tomatoes would be excellent! 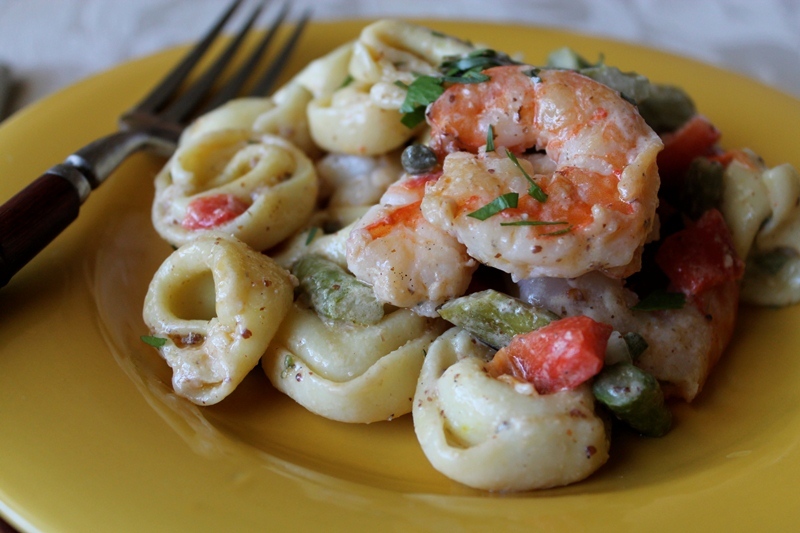 Combine together the tortellini, shrimp, asparagus and roasted pepper in a large bowl. Gently mix in the Ravigote. Garnish with snipped herbs. Ravigote is a traditional sauce born from the classic mother sauce, mayonnaise. From the French word Ravigoter, meaning to refresh or reinvigorate, this easy-to-make, piquant sauce is perfect for cool summer meals and pairs well with any type of seafood salad. There are many variations of this sauce but this is my favorite version. 1. Add the egg to the bowl of a food processor and pour the lemon juice over it. Let stand for one minute, then add the mustard. 2. Turn on the food processor, and dribble the oil in slowly through the feeder tube.